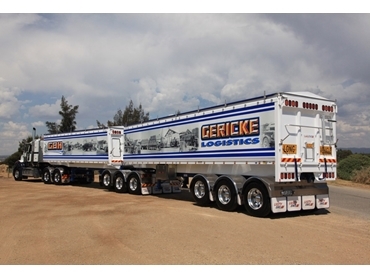 Gericke Logistics, set up in 2003 by leading South Australian liquid cartage contractor, Gericke Bulk as a new arm of the business began with a Lusty EMS chassis semi-tipper to service clients with their bulk grain and fertiliser transport requirements. By late 2012 Gericke was once again in the market for new equipment in order to boost their capacity. Whilst their core activities focus on the transport of canola, beef and mutton oils around the south-east region of South Australia and Naracoorte, Managing Director and Company Owner, Matthew Gericke has closely monitored and nurtured the Company’s grain and fertiliser cartage business. The growing demand from clients for the continuation of quality transport service encouraged Matthew to add a new Lusty EMS lead slider and chassis tipper B-Double combination into the fleet. The new Lusty EMS combination was built up in consultation with Kym Penhall, Area Sales Manager for Lusty EMS dealer, Transport Connection. The chassis for both trailers was constructed using Domex 700 grade high tensile steel that helped reduce overall tare weight of the combination by approximately three quarters of a tonne whilst maintaining strength and durability and maximising payload capacity. Matthew was also keen on a customised solution to enable a more efficient method of tipping grain from the lead trailer, eliminating the build-up of product between the guards and allowing a cleaner and faster tip. To achieve this, Lusty EMS Engineers came up with the ‘centre tip through chute’, which was integrated between the front and centre axle group and extended to the top of the guards. Admitting that demand for grain freight services had plateaued in recent times, Matthew is optimistic about a market turnaround and believes he now has the right equipment mix between single and B-Double semi tippers that will provide additional versatility to meet customer requirements.